← Riddle me this… A contest! We are one step closer to Spring – the clocks have been turned ahead and I will take an hour less sleep if it means that it will be warmer soon! This next redo was an attempt at willing spring to arrive more speedily – it’s a nice pastel green, that means it must be nearly spring, right?! There was a little wooden plug missing in the front, so I popped one off the back and replaced it. I figured no one would miss it there. 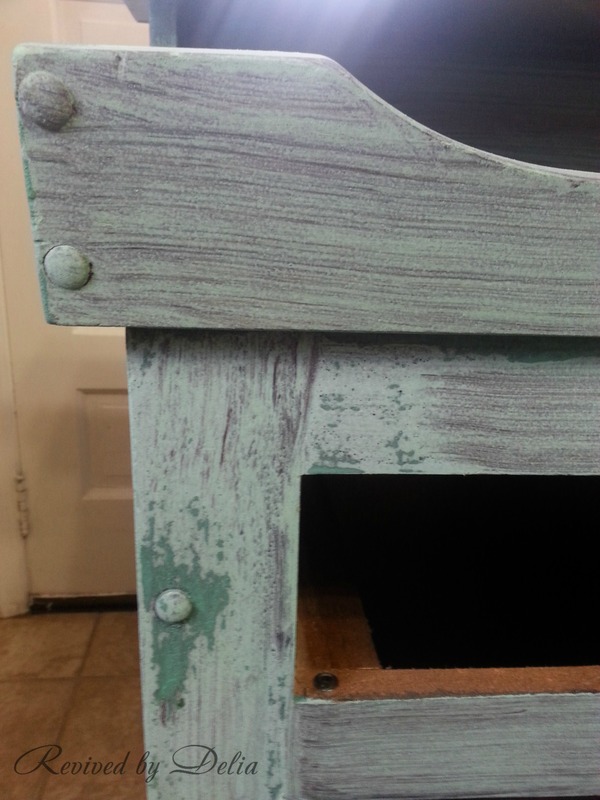 After mixing up a custom color using The Old Fashioned Milk Paint Company’s Milk Paint Base, blue, green, and white acrylic paints, I gave it two coats and waited for it to dry. 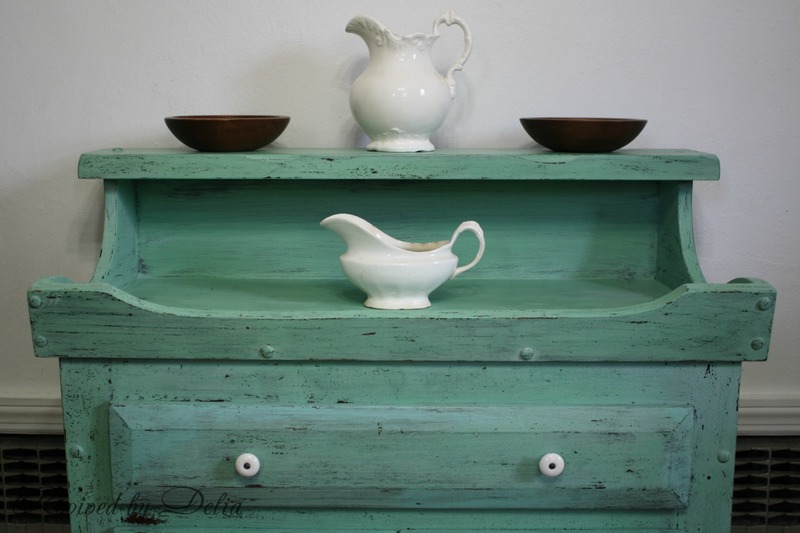 If you would like to know how to make any color of your own milk paint, I posted instructions here. 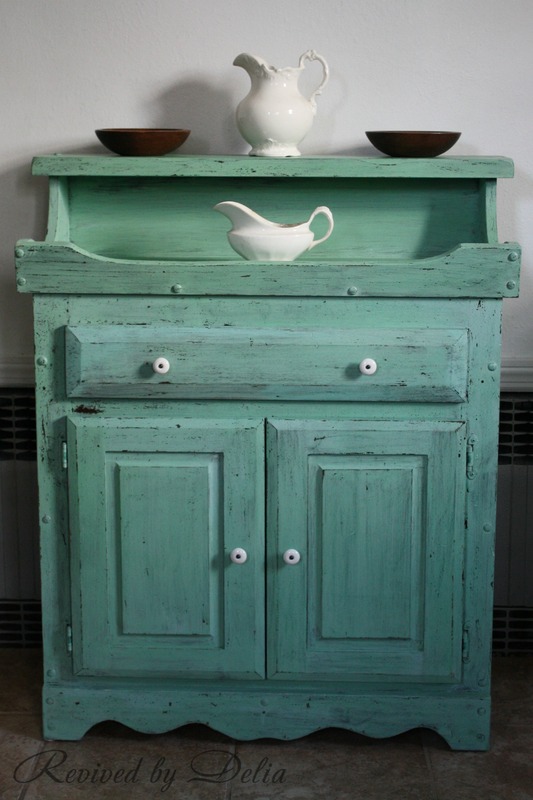 Even if for nothing else, this could be one of the biggest reasons I love milk paint – it dries so quickly. The first coat dries within minutes, the second takes a bit longer, but is generally workable within an hour or so. I don’t very often go past the second coat – I find that it just starts to pull up your paint after that. Not always, but enough, and two coats usually gives the aged finish I’m looking for. This picture was after the first coat was applied. The lighter colored areas are dry – it always looks fairly ugly after the first coat. While the paint was drying, I cut and secured a pretty vintage paper for the drawer liner. Once the paint dried, I went to it with my scraper, knocking off any areas that were open to chipping. A quick coat of clear paste wax and this baby was done! I put the original knobs back on – previously they looked tired, but with the green, they popped and look fresh. Please leave me a comment and let me know what you think! And if you would like to follow me, there are a few different options to the right. This is sweet! It looks way different now, you really saw the potential in it. Nicely done! Beautiful color, Delia! And I love the drawer lining. Another gorgeous makeover Delia! 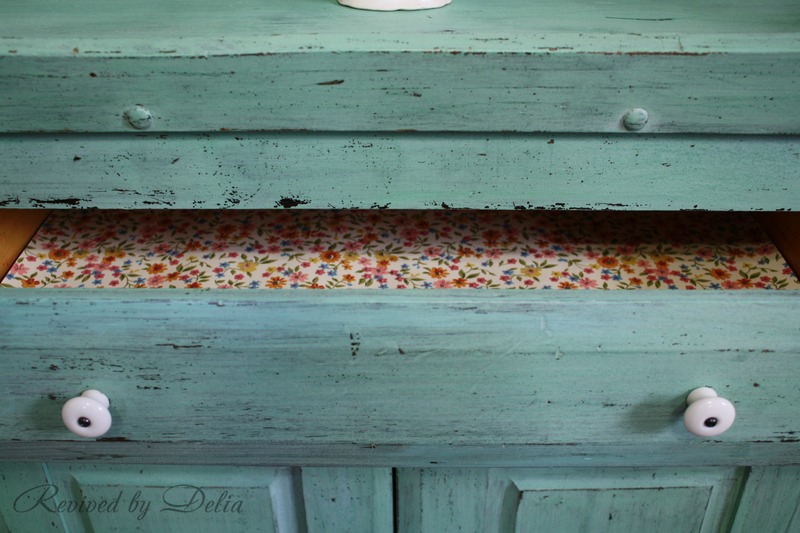 Love the detail of lining the drawer with that pretty floral pattern. Thanks for sharing with us again at the DIY Sunday Showcase Party! Thanks so much Marie – I’ve been holding onto that liner for the right piece! Thank you so much – I couldn’t get over how different the knobs looked! The tone is so soothing, perfect for the beach. I would love for you to share on my Chic By You Link Party @ http://chicbytab.blogspot.ca/2014/03/chic-by-you-wednesday-link-party-3.html. Hope to see you there! Thank you for the invite – I did link up. Have a nice week! Thank you for stopping by and the comment, Cathy! 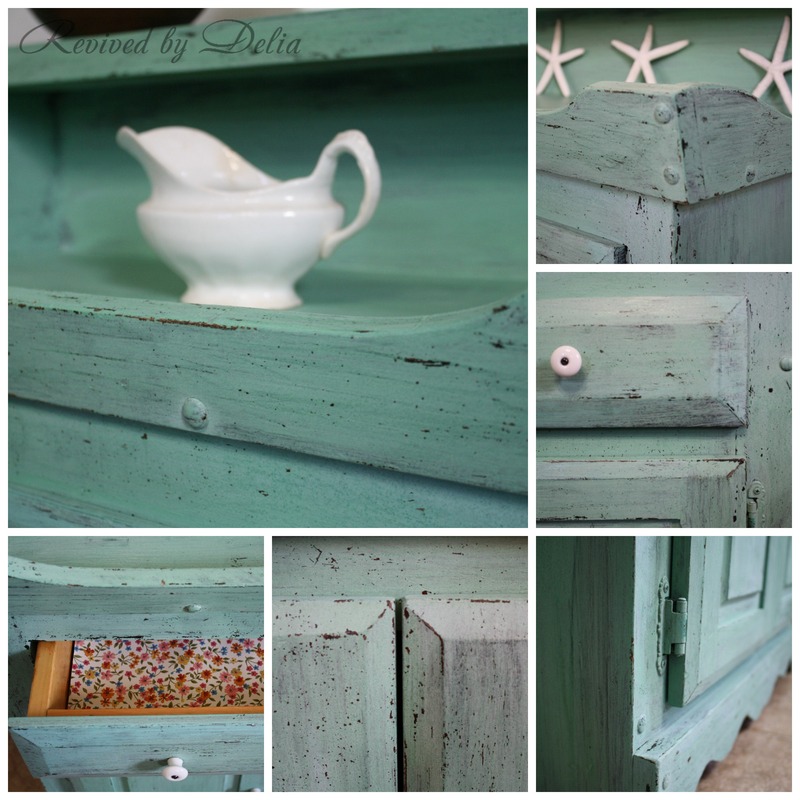 I really love the color, and I didn’t even realize there was a milk paint base! Your dry sink is so pretty, and I love the custom color. 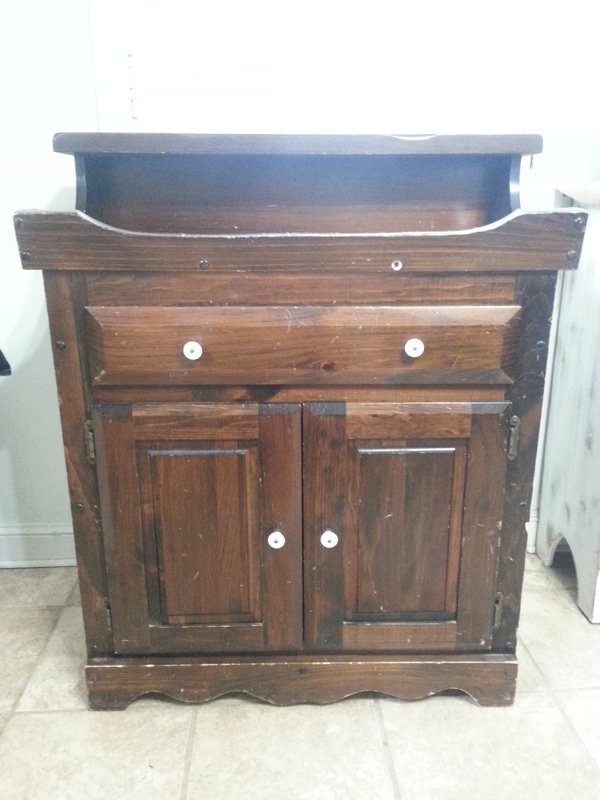 Thanks Ricki – the milk paint base is awesome. The only thing I’ve noticed is that it doesn’t seem to chip as nicely when mixed with acrylics. I have to work at it more. 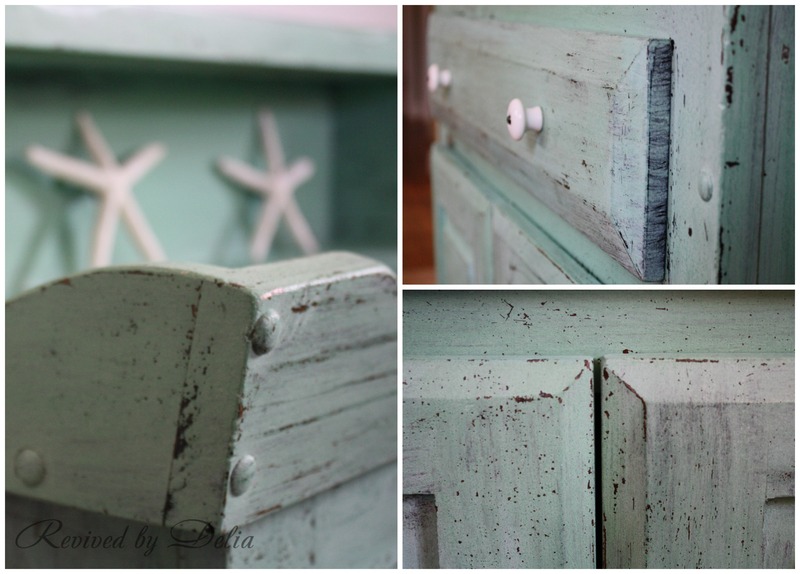 But I still love the finish – it’s just a bit different than full milk paint. I love the color and the chipping. Wow this is super pretty! I love the color you chose! This is beautiful! What a transformation! Love your color choice. 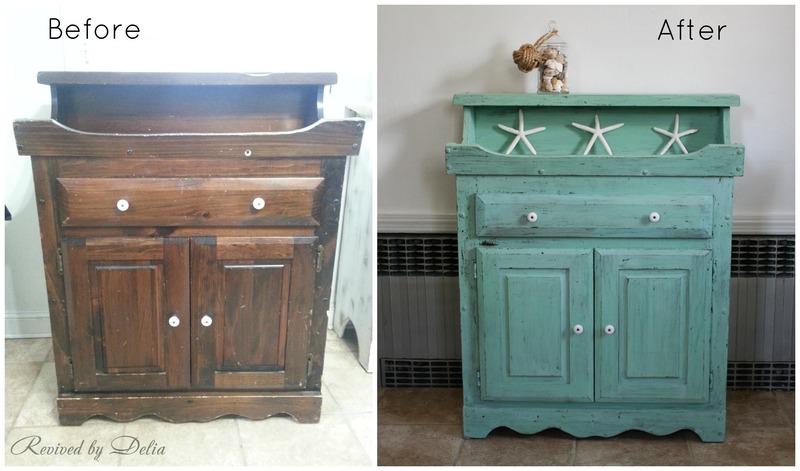 What a gorgeous makeover – love love love how authentically ” chippy ” it looks! That color and the chippy look are absolutely gorgeous on this! The white knobs just pop now instead of looking like they don’t really belong there on the before picture. Awesome job! That’s a charming, adorable transformation. And I can tell you at least one new use for a dry sink. I have been searching for one to put on the wall between the door to the garage and the kitchen. It will be a spot for charging phones and iPads, jopening the mail, dropping off my purse and my husband’s keys, wallet, and sunglasses. I think it will help us stay organized but keep the mess a little hidden from view.